Treasure Hunting ~ Collecting | Hey, Girlfriend! For as long as I can remember, I have enjoyed going through thrift and junk stores to hunt for treasures. The thrill of collecting is enough to get me out of my cozy bed at the crack of dawn to be one of the first at a garage or estate sale. I never know what I’ll come across, but for the most part, I always return home with a treasure. Whether it’s big or small, it’s always worth it! 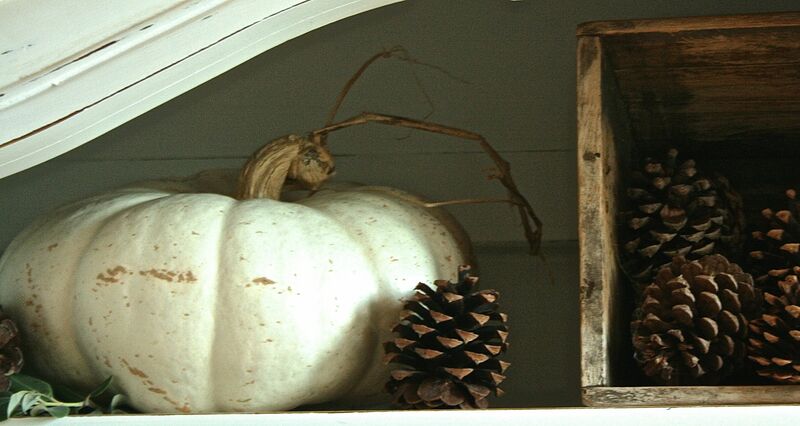 My first home was decorated in “Early Americana Thrift”. I’ve always loved pulling quirky pieces together. Each item has a story and in the moment of the hunt, I’ve enjoyed looking at every piece and mulling over whether it was worthy of coming home with me to be another project or if I should leave it for the next junker. It’s always a thrill for me to jump out of the car, coffee in hand and rummage through boxes of other people’s things and wonder who owned them before and what was their history? My friend, Antoinette, has always been a die hard junker friend of mine. Over the years, we would search the newspapers ahead of time and then map out which sales we were going to hit first. When my kids were young, we would pack up my two footie pajamed toddlers with blankies, cheerios, milk, and snacks in hand and head out while it was still dark. We would find the best spot in front of the garage sale, slide the van door open so we could keep an eye on the kids, turn on the hazard lights and with lightning speed scope the place out. One of the best estate sales, Ton and I went to, was in a questionable part of town. The ad said “Huge Estate Sale”, but when we pulled up there were a bunch of serious early birds standing in front of an old boarded up house and stand alone beat up garage. We were pretty disappointed, but decided to stick around as long as we were there. We were some of the first ones inside the house and to our amazement found out the house and garage had been owned by a pair of antique dealers who had passed away and now their children were trying to clear out their “junk”. “One man’s junk….”. We left with the van overflowing with treasures (no, the kids weren’t with us) and even had to make a trip to the bank for extra cash. It was awesome! SCORE, SCORE, SCORE! We still laugh about that! 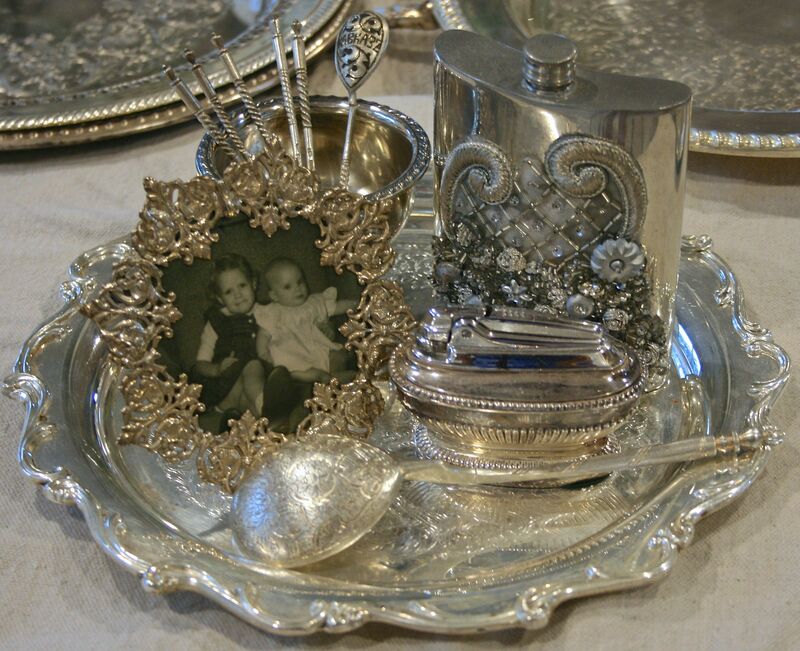 I’ve gotten a bit side tracked, but my post today is about finding treasures such as silver and silver plated items and using these beautiful pieces to add sparkle in your house. 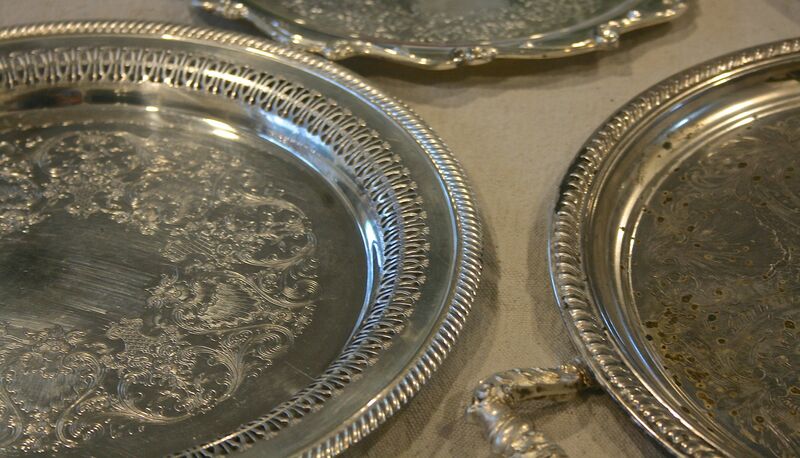 I love silver mixed with ironstone, and other eclectic pieces and those jewels are often passed by because they require occasional cleaning. I know, cleaning silver is laborious, but worth the effort. If the piece is pitted, as the one on the right is, it can still be functional. 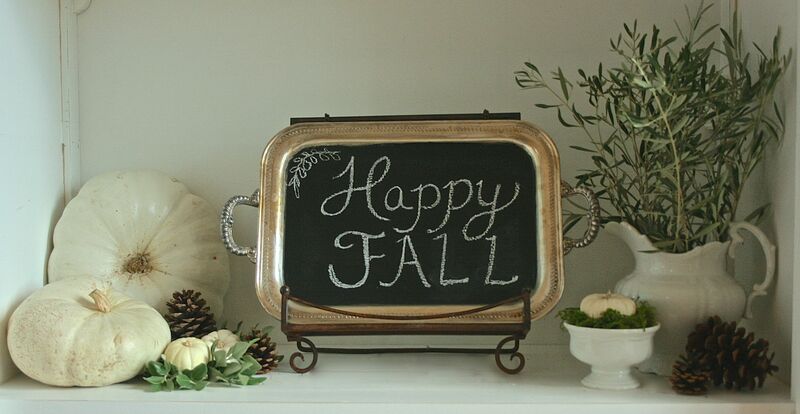 I have chosen to make chalkboard signs out of a few of them. It’s a fun and simple project and is a great repurposing idea. After cleaning the trays, I used painter’s tape to mask off the edges and then applied several coats of chalkboard paint. Follow the directions of the paint you choose to use. I applied several coats to make sure the surface was coated well. Below is the final outcome of a silver tray that I purchased at my local thrift store. Now, I’m always on the look out for pieces like this. With a bit of cleaning and some paint, I think these make a great statement piece and gifts for friends to be used for all seasons. 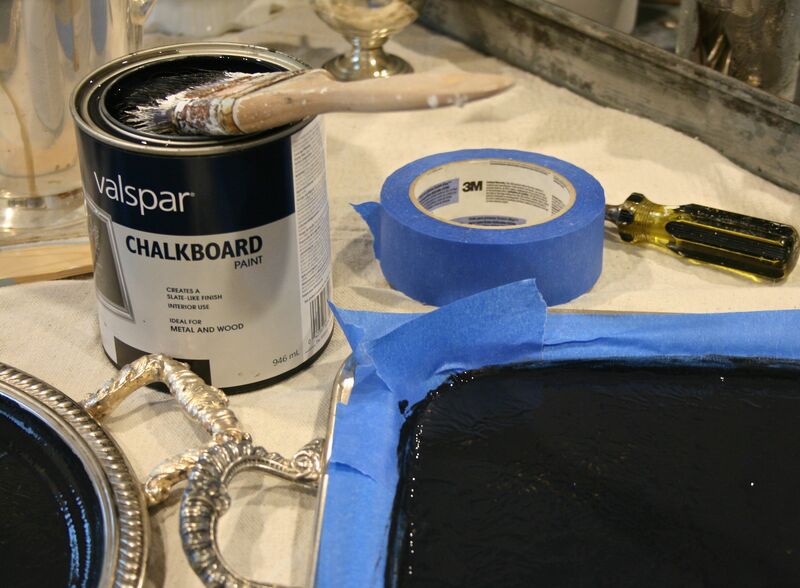 Chalkboard paint can be used for walls, old cutting boards, and wooden boxes. Let your imagination run wild! Our girlfriend, Jeri C., painted a wall in her kitchen so her grand-babies could draw and doodle. While they are hard at work, she sneaks a few pictures of them. Sweet memories and timeless treasures! Do you have any favorite thrift store finds? Please share! Hey thats me in the picture! I love my sister’s style and wish I had even a fraction of her talent! I love all those pretty treasures! You have such a good eye! I’ll have to do that up here in Northern California! I’m sure there are some great finds up in this area!